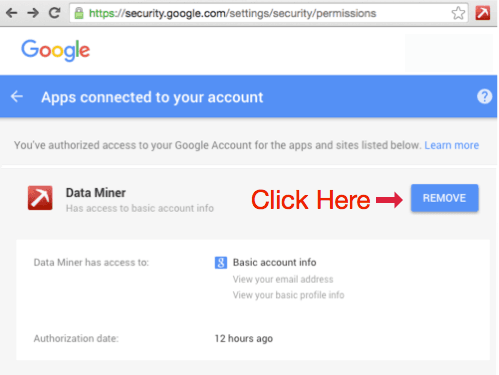 Why Data Miner uses Google account as login mechanism. Over 100,000 active users trust us with their data ! Why Data Miner needs login? Requiring login with a Google account significantly cuts down spammers and malicious users interfering with Data Miner service. We want to spend our energy on creating new features for your and not on fighting spammers. We hope that requiring a Gmail account is not an un due burden. How to revoke access to your Google account? Visit the Google access management site https://security.google.com/settings/security/permissions and click remove Data Miner.